There have been many approaches to Indigenous economic development. Most often imposed, such approaches have often been assimilationist in nature, by arguing that cultural values and knowledge actually place Indigenous peoples at a disadvantage. 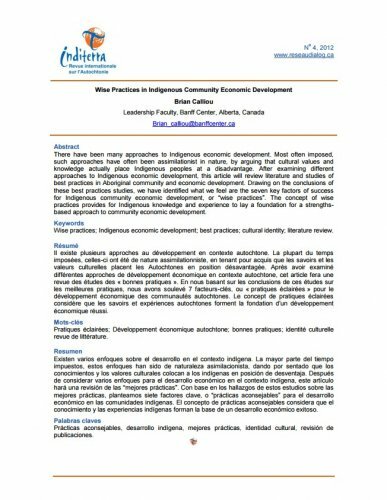 After examining different approaches to Indigenous economic development, this article will review literature and studies of best practices in Aboriginal community and economic development. Drawing on the conclusions of these best practices studies, we have identified what we feel are the seven key factors of success for Indigenous community economic development, or “wise practices”. The concept of wise practices provides for Indigenous knowledge and experience to lay a foundation for a strengthsbased approach to community economic development.